What is the workstation compatibility? It supports Windows workstations running XP (32 bit & 64 bit), Vista, Windows 7 (32 bit & 64 bit) and Windows 8. How do I add support to my printed objects? Our slicing software recognises the need of supports and generates minimum supports automatically. What is the strength of the printed output? Strength of the object or parts depends heavily on the of amount of infill which can be controlled via the supplied software. If you need a quick prototype just for display, you can use lesser infill making the part almost hollow. However, if you need a component for functional testing, you can opt for higher infill, making the 3D printed object stronger. 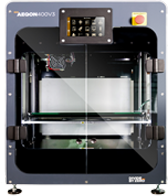 What is an Accucraft series 3D printer? The Accucraft series from Divide By Zero is an industrial-grade 3D printer that use Fused Filament Fabrication (FFF) to create 3D models from a 3D CAD file (STL). What materials can the Accucraft series of 3D Printers print? Currently, the Accucraft i250+ can print in ABS, PLA, HIPS, PETG, Flexible filaments,Carbon Fiber, PC, nylon, wood-fills etc. At Divide By Zero, we are constantly experimenting with new materials. What can I print with the Accucraft i250? Any prototype with minimum wall thickness 1.2mm and minimum overall size more than 2mm can be printed. How hard is it to set up the Accucraft series 3D printer? Setting the Accucraft 3D printer with the supplied step-by-step instruction manual is simple. All instructions about loading the software, connecting to a workstation, and importing STL files are carefully explained in the manual. When you first use the machine, you need to manually calibrate the height of the table. Once that is done, the settings can be stored on the machine and is automatically recalled when powered up. Do I require a special location to install the 3D printer? 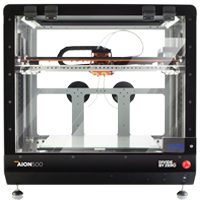 Accucraft series 3D printers are compact and light enough to be setup on a desk and operates via USB, SD Card, Ethernet and Wi-Fi, while for Aion 500 requires room temperature to be maintained at 28 degrees whereas operating mechanism is same. How hot does the 3D printer get? The 3D printer’s outer body temperature reaches upto 50-60°C. Well ventilated spaces aid in better heat dissipation. How fast is the 3D printer? The speed depends on the size, material, choice of resolution, infill level, support material, raft influence, and many other factors. 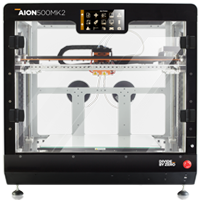 Usual 3d printers can print from 8 - 10 cubic cm per hour, Accucraft series machines can print upto 15 cubic cm per hour & Aion series machines can print upto 30 cubic cm per hour.